A spontaneous mid-week bite to eat was planned with a lovely gal I work with. So we decided that we’d try somewhere that neither of us had been before and ventured down Colin Street to Akheele, hiding in a little court yard opposite Caffissimo. I think ages ago I had stopped into this place for a take away salad and i’d noticed a few tables outside but hadn’t really had the need to investigate much more than that at the time, so I was plesanatly surprised on this visit when we looked around the back and there were more tables hiding there! We chose a table in the outdoor courtyard, next to a pretty fish pond. It was all very scenic and felt like a real soujorn from the office. Service was very prompt and super friendly. I had taken a sneak peak at some of the salads on offer inside and they all looked fresh and fabulous! So it was a tough choice between a serve of those or one of the options on the menu, many of which looked apealling and were also very reasonably priced…. a bit plus for an impromptu lunch outting. 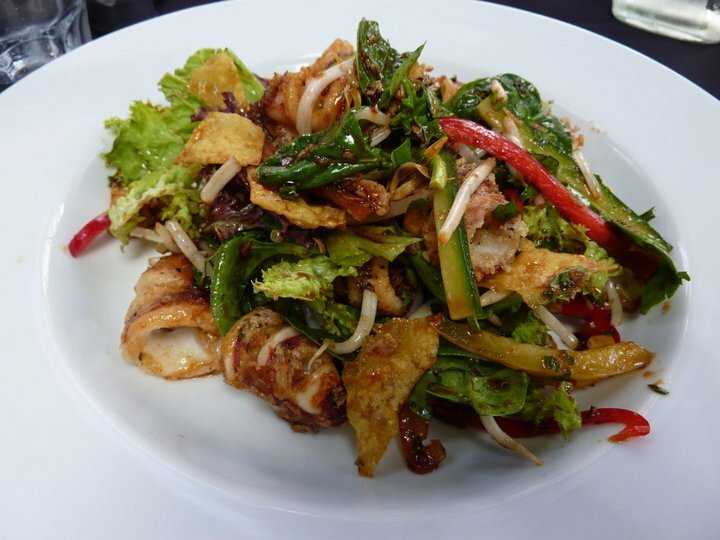 So my lunch companion went for the pie of the day, which came served with fries and a small salad and was described as a chicken and seeded mushroom creation, while I went with the salad and pepper squid salad, which was served thai style. Both servings were very generous (and didn’t take too long – added plus)! My squid was perfectly cooked, nothing chewy about it at all. The seasoning was a little on the salty side, but given how well it had been cooked this could be forgiven. The salad underneath was an interesting combination of leafy greens and cucumber and a variety of different coloured capsicum, but it was the dressing that disappointed me. It was really sweet, to the point that I just couldn’t eat much of the salad, sort of just picked out what I could, so that was a little unfortunate. The pie fared better, but the interesting thing was what was hiding under the pastry top of my friend’s pie…. it was larger chunks of red meat, so very un-chicken like… and definitely not with mustard. 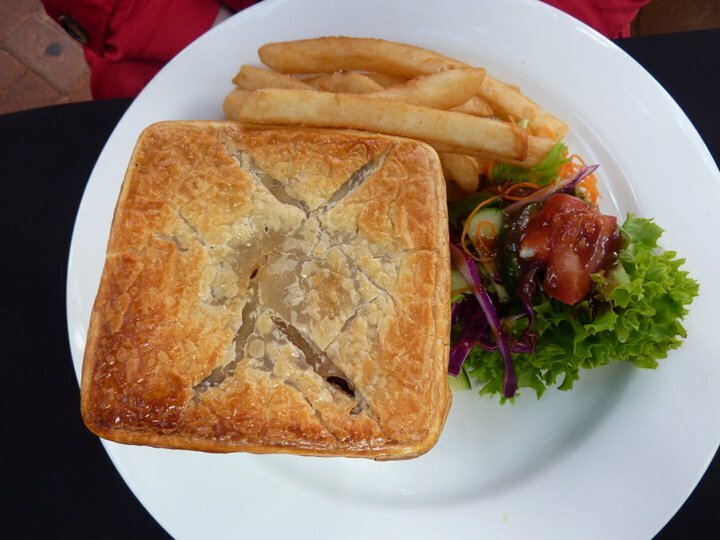 So yeah it was a lamb and rosemary pie, so still very tasty yes, but not the chicken and mustard pie that had been expected…. a miscommunication from the kitchen to the waitors is all it was I’m sure. So in I wasn’t overly impressed with my selection but there were pleasing elements (in particular the company) so I think I would go back to give it another go. It’s just a very pretty spot to sit and eat and out of the way from the traffic out the front of some of the other cafes dotted along Hay Street.